You wouldn’t bl**dy believe it! The two porthole openings in the galley are in the wrong place. When entering the walk-through galley from the back cabin there is a wall oven, gas hob and some bench space on the right. On the left is a full height pantry followed by a sink and then bench top. In both cases the problem is the current porthole opening overlaps the planned wall oven and pantry. Even more galling; now the shell has been grit blasted you can see the faint lines in the shell where the original porthole opening has been filled in on one side of the boat. AND IT WAS IN THE CORRECT LOCATION!!!! So we now face having to weld up the current galley porthole openings and cut out the original portholes for a second time. One option we are considering is to mirror (flip) the galley layout. 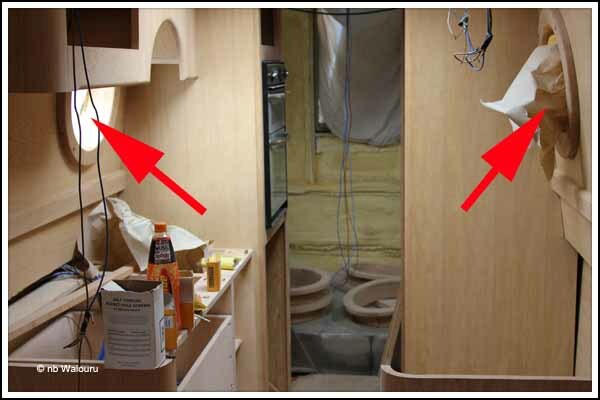 This would place the pantry on the opposite side of the boat where it wouldn’t interfere with the existing porthole opening. It would mean only one porthole needs to be moved. However it would also result in the gas appliances being on the opposite side of the boat to the gas locker and the sink on the opposite side to the shower. But wait………… I remember the photos we took of Waiouru back in June last year when we found her at Hixon. Ben Harp had fitted the wall oven. How could it fit then but not now? You can see in the June photo above the two galley portholes along with the oven and the pantry opposite. After carefully examining the markings and screw holes on the timber battening I now realise this was achieved by reducing the length of the back cabin. We probably wouldn’t have realised what had been done until we attempted to fit a 6’3” mattress into what would have been a cabin less than 6'ft long. Only height challenged guests would have been able to sleep in the bed! Is that the shell builder, then, rather than Ben Harp?